Introduction | The five Gleason grades | The combined Gleason score or Gleason sum | What does the Gleason score mean? Figure 1: This illustration shows Dr Gleason's own simplified drawing of the five Gleason grades of prostate cancer. Grade 1 appears on the far left and grade 5 on the far right. Adapted from Gleason DF. The Veteran's Administration Cooperative Urologic Research Group: histologic grading and clinical staging of prostatic carcinoma. In Tannenbaum M (ed.) Urologic Pathology: The Prostate. Lea and Febiger, Philadelphia, 1977; 171-198. 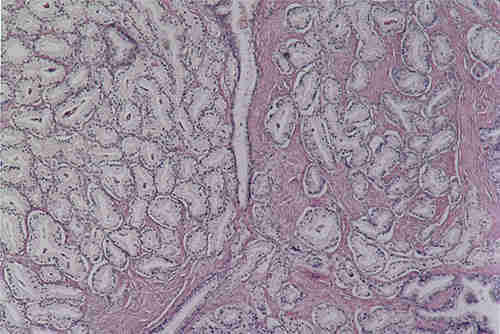 Gleason Grades 1 and 2: These two grades closely resemble normal prostate. They are the least important grades because they seldom occur in the general population and because they confer a prognostic benefit which is only slightly better than grade 3. Both of these grades are composed by very pale glands which grow closely together. In grade 1 they form a compact mass; in grade 2 they are more loosely aggregated, and some glands wander (invade) into the surrounding muscle (stroma). 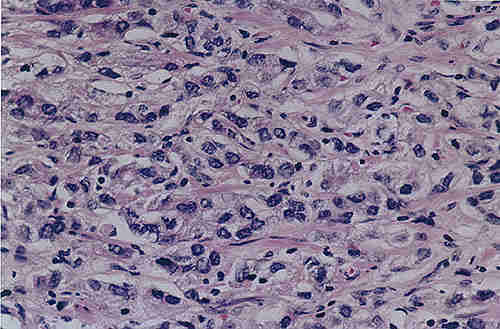 Figure 2: Grade 1 (left) and grade 2 (right) protate adenocarcinoma. Both have pale cells and well formed, separate glands with lumens. Grade 1 is more compact (less invasive) than grade 2. Illustration courtesy of John E. McNeal, MD, Department of Urology, Stanford University School of Medicine. Gleason Grade 3: This is the most common grade by far and is also considered well differentiated (like grades 1 and 2). This is because all three grades have a normal "gland unit" like that of a normal prostate; that is, every cell is part of a circular row which forms the lining of a central space (the lumen). The lumen contains prostatic secretion like normal prostate, and each gland unit is surrounded by prostate muscle which keeps the gland units apart. In contrast to grade 2, wandering of glands (invading) into the stroma (muscle) is very prominent and is the main defining feature. The cells are dark rather than pale and the glands often have more variable shapes. 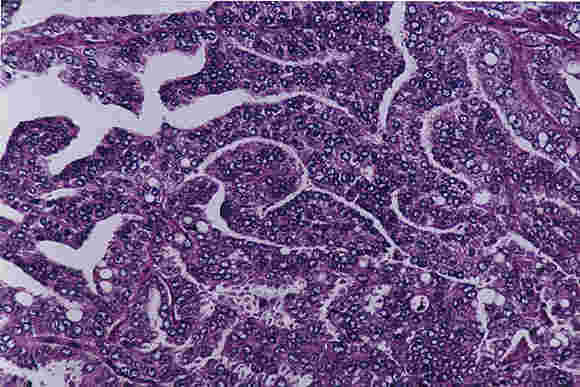 Figure 3 shows invasion under low magnification; Figure 4 is part of the same area at higher magnification and shows the separate gland units and the dark cells. Gleason Grade 4: This is probably the most important grade because it is fairly common and because of the fact that if a lot of it is present, patient prognosis is usually (but not always) worsened by a considerable degree. Here also there is a big jump in loss of architecture. For the first time, we see disruption and loss of the normal gland unit. In fact, grade 4 is identified almost entirely by loss of the ability to form individual, separate gland units, each with its separate lumen (secretory space). This important distinction is simple in concept but complex in practice. The reason is that there are a variety of different-appearing ways in which the cancer's effort to form gland units can be distorted. Each cancer has its own partial set of tools with which it builds part of the normal structure. Grade 4 is like the branches of a large tree, reaching in a number of directions from the (well differentiated) trunk of grades 1, 2, and 3. Much experience is required for this diagnosis, and not all patterns are easily distinguished from grade 3. Figure 5 and Figure 6 show two such patterns. This is the main class of poorly differentiated prostate cancer, and its distinction from grade 3 is the most commonly important grading decision. 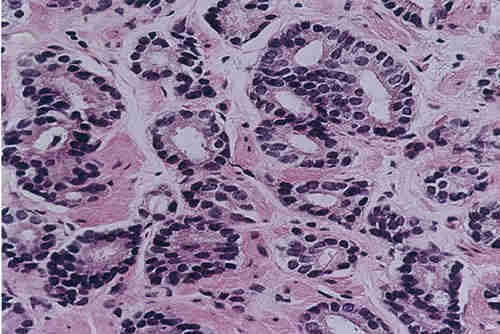 Figure 5 (top) and Figure 6 (bottom): Grade 4 carcinomas with two different architectural patterns, each of which has lost the expression of complete "gland units," seen at higher magnification. There are sheets of cells with randomly scattered lumens. Illustrations courtesy of John E. McNeal, MD, Department of Urology, Stanford University School of Medicine. Gleason Grade 5: Gleason grade 5 is an important grade because it usually predicts another significant step towards poor prognosis. Its overall importance for the general population is reduced by the fact that it is less common than grade 4, and it is seldom seen in men whose prostate cancer is diagnosed early in its development. This grade too shows a variety of patterns, all of which demonstrate no evidence of any attempt to form gland units. Figure 7 shows only a sea of black nuclei with no pattern. The variety of different appearances is less than for grade 4 because there are fewer ways to do nothing! 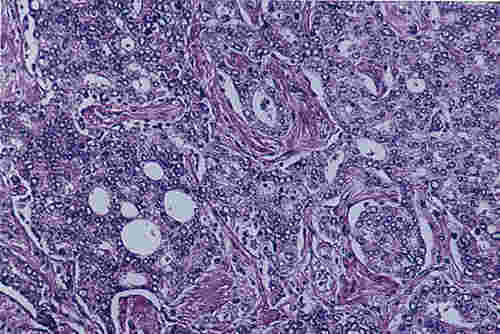 This grade is often called undifferentiated, because its features are not significantly distinguishing to make it look any different from undifferentiated cancers which occur in other organs. 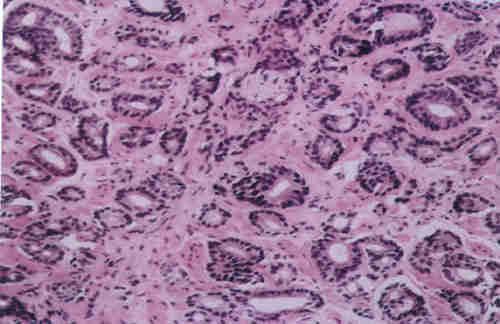 Figure 7: Grade 5 adenocarcinoma, consisting of sheets of cells whose lack of pattern in nuclear arrangement indicates total loss of architecture, seen at higher magnification. Illustration courtesy of John E. McNeal, MD, Department of Urology, Stanford University School of Medicine. If you are interested in seeing other examples of samples showing Gleason grades, try looking at the materials from the University of Pittsburgh Medical Center. In particular, they show several examples of grades 3 and 4.